My winter at Wildhorse cat-skiing has begun. With the owner/lead guide Trevor recovering from a broken leg sustained in the Fall, I’m taking on all guiding duties for a little bit. The snow-pack is thinner than usual, and we haven’t had much new snow of late, but with perfect boot-deep powder skiing on all aspects, our clients are invariably stoked at the end of the day. I have mixed feelings about guiding. Of course I course I love skiing fresh powder, but the experience can’t compare to the freedom, challenge, and camaraderie of adventuring with close friends. What does make it worthwhile is the the satisfaction of providing people with what is often a peak life experience. It’s uplifting to be associated with such joy. Just take your close friends skiing at wild horse! There are some seats available on December 27th and 28th. 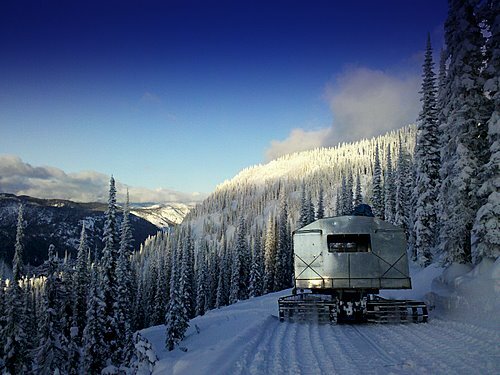 1-888-488-4327 or catskiing@kootenayexperience.com for more information on our standby deals. Good luck with the guiding!